Street food is one of the most exciting emerging sectors of the foodie landscape, creating impromptu dining experiences made possible by following trucks on Twitter or Facebook to find out where they are, and then lining up on the street to get some of the (often unique) food being served up. It was only a matter of time before a book came out dedicated to the subject, and Food Trucks: Dispatches and Recipes from the Best Kitchens on Wheels is a fun and timely ode to The New Street Food. It is full of stories and recipes, mostly savory, but a small handful of sweet ones. The one that I zeroed in on, though? Yellow Submarine in Miami, Florida--because they had the most compelling dessert recipe, for Chocolate Pudding and Cookies. It's sort of like my favorite Banana Nilla Wafer pudding, but with chocolate pudding and no bananas. Make the pudding according the package instructions. Let the pudding rest for 2-3 minutes, then add the table cream and condensed milk, mixing very well. 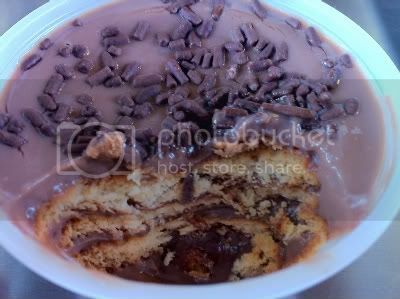 Into a large, round glass bowl, pour enough of the chocolate mixture to cover the bottom of the container. Add a layer of the Maria cookies, then top with a layer of the pudding; repeat until the cookies and chocolate mixture are used up. Let the treat rest in the fridge for 2 hours, then spoon out on to plates and serve.